There was an Italian Restaurant named Gino’s on 61th & Lexington in New York City. I sadly say was, because it closed in 2010, and it’s missed by all. On every main course plate was tender sauteed Escarole and wonderful small puffed potatoes. I can still recall that plate and to a lesser degree that taste. But for me Escarole is not an easy green to cook. I continue to have a hard time getting it to that desired stage of tenderness. But one day I shall conquer Escarole. 1. Wash the Escarole in a large bowl, half & tear into edible small pieces. Drain, but them moist. 2. Heat a large saute pan, add the EVOO, when almost smoking add the Garlic slices & Red Pepper Flakes. Saute until they begin to color & remove them to a small bowl. 3. At this point be very careful as you add the Escarole in batches. As they come in contact with the EVOO they will spatter. When all calms down add Salt & Black Pepper & toss until well coated. Add the 1-1/2 cups of Water & saute. 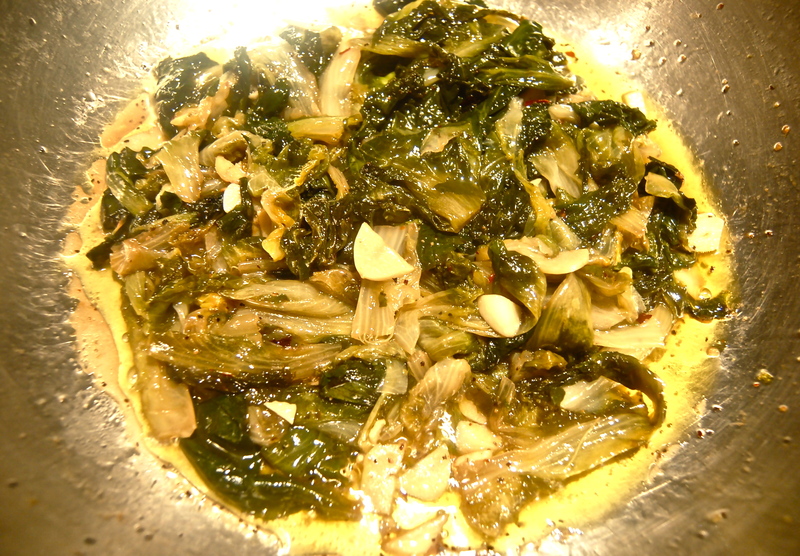 Check their progress occasionally & when their tender, return the sauteed Garlic to the pan. Toss to combine & turn off the heat.